Enterprise Tondelli have been supplying bottling equipment for many years to UK regional brewers, as well as some of the largest multi national breweries in the world. As well as very large bottling lines we also supply bottling lines to small, craft canning solutions (starting at 3,500cph) and micro breweries. With the lower speeds of the lines we have the ensured that we supply lines that do not compromise on quality of either performance or construction. For instance on performance the filler carousel with double pre-evacuation gives very low air pick up during filling, typically less than 50 parts per billion which ensures a longer shelf life and reduces potential for off flavours. The rinser carousel can either rinse with fresh water or peracetic or a number of other alternatives. On construction the quality is maintained with such features as standard as a stainless steel base frame with a stainless steel clad mild steel table top plate which gives a longer life and higher hygiene in the filler housing. With mild steel base frames painting is required after a period of time. The crowning or capping turret is supplied by a specialist closure machine manufacture to ensure trouble free operation and thus reduce down time and spoilt product. 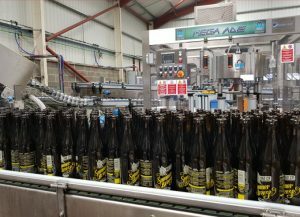 Within the above small beer filling lines we can supply a number of variations to meet your marketing and budget needs. For instance we can offer the following labeller variations, wraparound self adhesive, , wet glue or self adhesive for body label, back label, neck of shoulder label and foiling. There are a number of packaging alternatives as well with either manual solutions or automatic packing possible. With an active planning department we are able to quickly supply a CAD generated layout showing the line configured in your building. Careful attention is also taken to ensure low operating costs both from a personnel point of view and also machine maintenance. 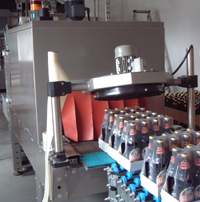 Maintenance contracts can be provided so that the customer is free to concentrate on production of beer. We can also supply the brewhouse. As your business grows we can supply bottling equipment to suit your needs with complete lines up to 66,000 bottles per hour being supplied by Enterprise Tondelli. Read our case studies here……..